Sivon-S S.A. is founded in 1994, entirely with private assets. Over the years our efforts were focused on self-improvement and quality service to our customers. 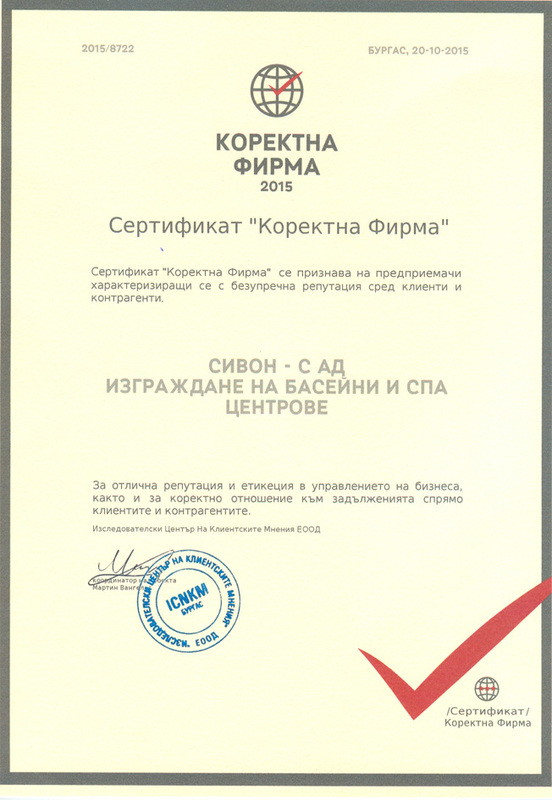 We are recognized as one of the most successful companies in Bulgaria and abroad in the design, construction, warranty and post warranty support of pools, fountains, aqua parks, SPA and wellness centers. The company employs highly qualified employees from its foundation up to date. With the expansion of our activities, the newly selected personnel is thoroughly trained according to our requirements. – Complex “Riviera”, whitch was honored with several awards: PRIMO – for 100 best hotels worldwide partners of NECKERMANN, obtained for the seasons 2002, 2003, 2004, 2007, 2008; PRIMO “TOP TEN” – for the first ten best hotels in the world, partners of NECKERMANN, obtained for 2005 and 2006 seasons. SPA in Park Hotel Pirin, Sandanski, who received prestigious European recognition – EUROPESPA Wellness Certificate of ESPA (European Spa Association) wellness facilities, safety, hygiene and quality of services offered and the prize for “Best Resort and Spa in the Balkans, 2007 ” in Balkan Association of Hotels and Restaurants. We create individual projects, which fully meet the specific needs, goals and expectations of every client. Our goal is to help your own dream pool and SPA to come true. We can build it in your garden, or why not exploit the free space in the house? We will offer to you to create around your luxurious pool places for exercise, relaxation and entertainment. This way you will make the investment not only in healthy lifestyle, but also – a clever investment in your own property. We produce our pools and SPAs as a high quality product on time, they are safe for use and aesthetically finished. We create a quality product, fully consistent with your budget. Your complete satisfaction is our goal. We understand that our work should have less impact on the environment and therefore our goal is to design more effective control systems that use less energy for all installations of the swimming pool and SPA. Find below a list (not exhaustive), shows the results of our business activities, partners we worked with over the years, companies whose products count on our work. As a result of our activities, over 1600 family and public swimming pools and aqua parks in the country and abroad were built. In the field of SPA centers, we actively work since 2000,completing construction of SPA and Wellness centers – from design to put into operation. Besides a number of family spas, built in the country and abroad, the result of self-contained activitis of Sivon-S S.A., a number of large objects were built. Over the years the technology, that our company is using – in particular, and its activities as a whole product, was recognized by leading foreign companies. This fact became a prerequisite for successful cooperation. Our company guarantees high quality not only because of the team, not only because of the good cooperation with our partners, but also because of the use of proper equipment, manufactured by world famous companies. Even now, reading again that list, we feel proud of what we do. And we believe we will inspire enough trust and courage in you – to let us share your dreams, to turn them into a beautiful reality. Result of joint venture activities of “Sivon-S "and the Austrian company "Silgmann"
Our goal is the full realization of your ideas, we are available from the design, construction, training of personnel to warranty and post-warranty support of family and community pools, aqua parks and spas. At your request we will provide you with the concept and vision about the equipment in your pool, spa and aqua park. We’ll give you ideas and information on current trends in the combination of standard procedures with new modern products, suitable for your SPA. Analysis of location, economic analysis of profitable investment, support of the applications calculation, support in managing pre-release period, preparation of menu, maps, training and qualification of your staff with the theoretical and practical training. Planning work schedules, accurately and timely calculating the costs of maintenance, cost optimization, technical management of the installation, commissioning, construction documentation, guarantee and support of your pool, Aqua Park and spa. You have a vision – we will realize it and create memorable experiences for you and your customers. Various types of products allows for complex equipment at your facility.